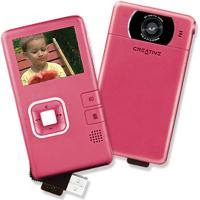 *Thank you to New Baby for donating this VADO camera from Creative Labs to our fun event. Please check out New Baby and consider adding your own vlog! Last weekend we had the opportunity to meet a wonderful new parenting advice search engine, Mamapedia, and now we'd like you to try the site out for yourself with our new contest, "What Can I Learn Today?" One grand prize winner will win a VADO digital video camera! Vlog about Mamapedia and your question/answer at New Baby. It's that easy! Then join us for another SiteWarming Party on Twitter Saturday, May 23rd from 9:00 to 10:00 p.m eastern time to find out who won! There will also be several great door prizes. I asked a question about headache relief for a tweener. Rubbing peppermint oil on the temples and back of neck was suggested. I will try that! We're potty training - how can I get daddy more involved so I'm not the only one having to run to the potty? Try using regular underwear during the day. Pull Up are glorified diapers. With the underwear they will begin to understand that if they don't want wet clothes, they will go on the potty. There are plastic underwear that go over the regular underwear so it will save you some laundry. Also, give him LOTS to drink and make him go in and sit on the potty every 10 minutes or so for atleat 2 minutes. Get an egg timer if you need to.